Lift Up Thine Eyes is our flagship offering and since 1982, we have distributed nearly four million volumes, to one family at a time. The inspirational words of this memorial volume are complemented by beautiful artwork from the great masters down through the ages. At the same time, the volume is a compassionate resource for spiritual guidance through the grieving process. It also provides a valuable index of biblical topics that will be helpful for years to come. 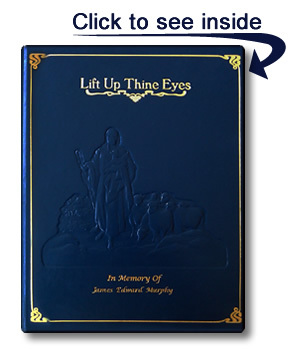 We personalize each volume for our families by engraving the name of the deceased in gold on the cover of Lift Up Thine Eyes.